I don’t know about you, but in between cake pop orders, I wind up with small amounts of a variety of colored candy melts. 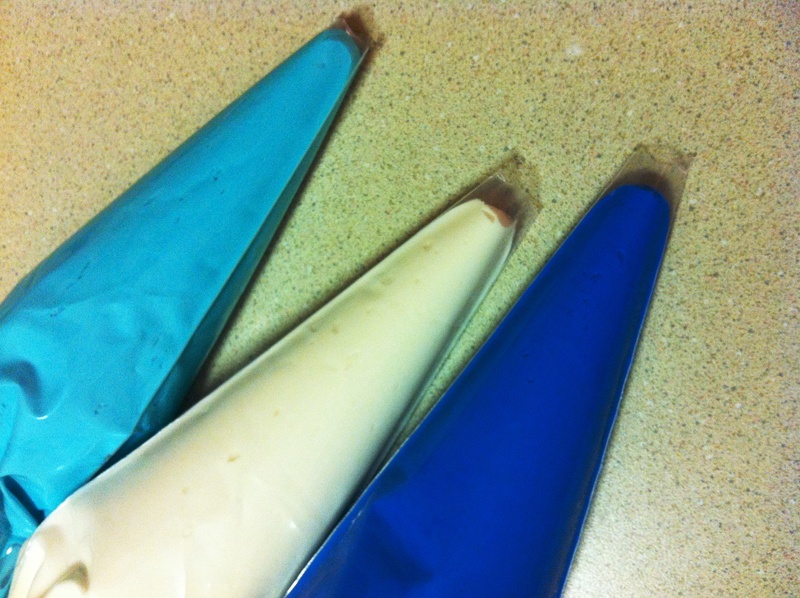 There’s not really enough melts to use them for cake pops, but I hate waste, and can never bring myself to throw them out… so, what to do with them? Well leave it to Martha Stewart to stike some inspiration! Earlier this week, I saw her Chocolate Faux Bois tutorial on Pinterest, and it gave me one of those Oprah “aha” moments – I could melt them down & make some cool cupcake toppers! 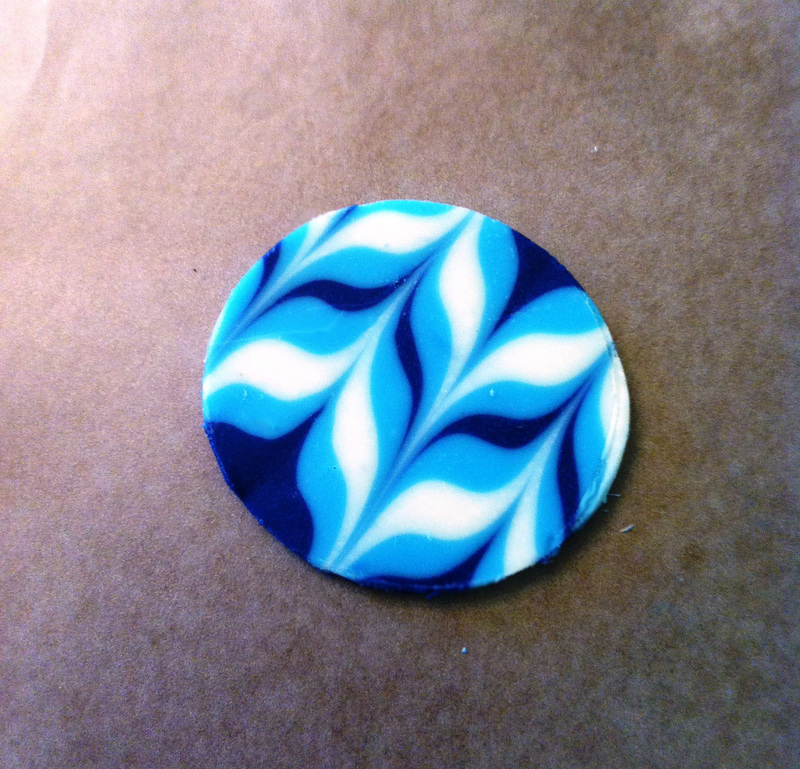 Since I had light and dark blue melts, and ombre is a really popular effect lately, I decided to do a blue ombre pattern. It was so easy, and so fun, I can’t wait to do it again! 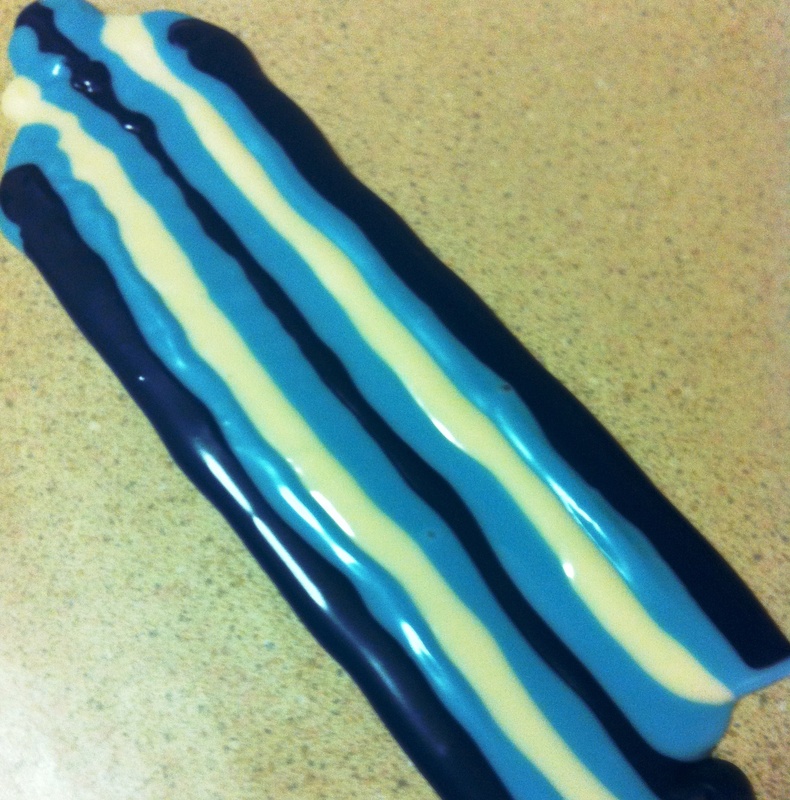 Put your melted chocolate into separate plastic bags that can zip shut. 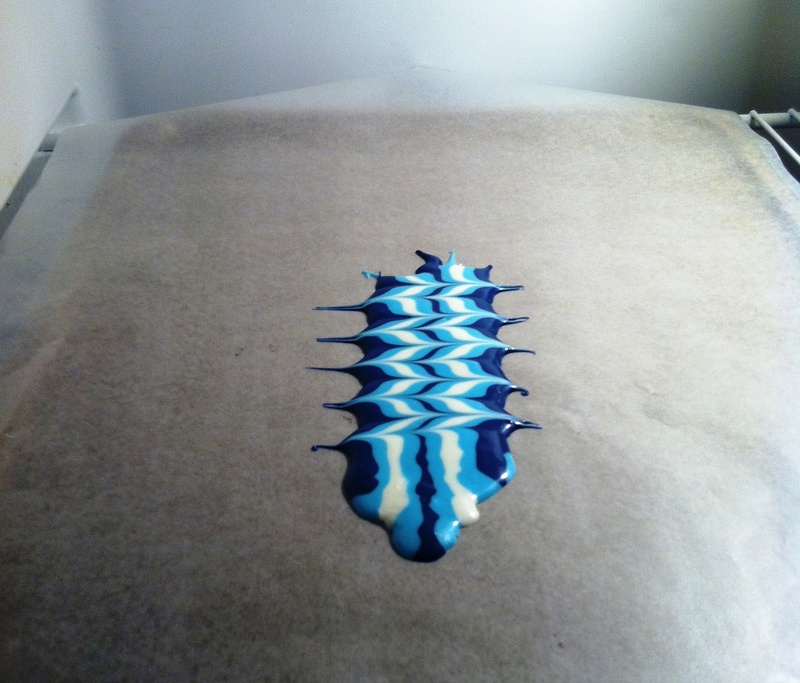 Snip a corner off of the plastic bag, and pipe lines of chocolate onto a sheet of wax paper, in whatever pattern you desire. 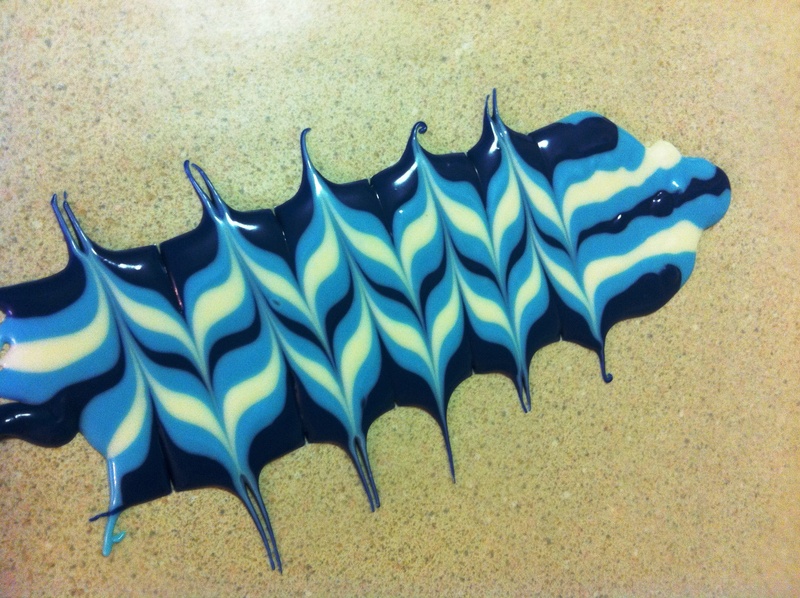 Now, see how there’s some rippling in the chocolate on the left side? 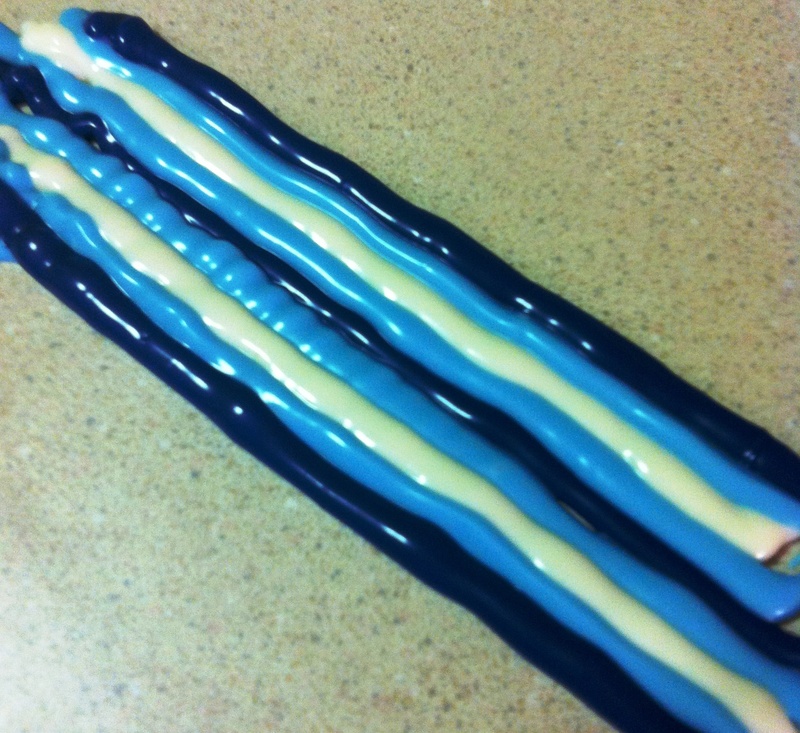 Holding the wax paper, shimmy it back and forth on the counter a few times, and it will smooth them out as shown below. Also, take this time to pop any air bubbles that rise to the surface. Drag a tooth pick in one straight line across all of the rows. This may leave a small gap, but we’ll get to that in a minute. Continue doing this across the entire length of your strip. Be sure to drag your toothpick straight through in individual strokes – do not use a curly motion to weave back and forth, or you won’t get those sharp lines. 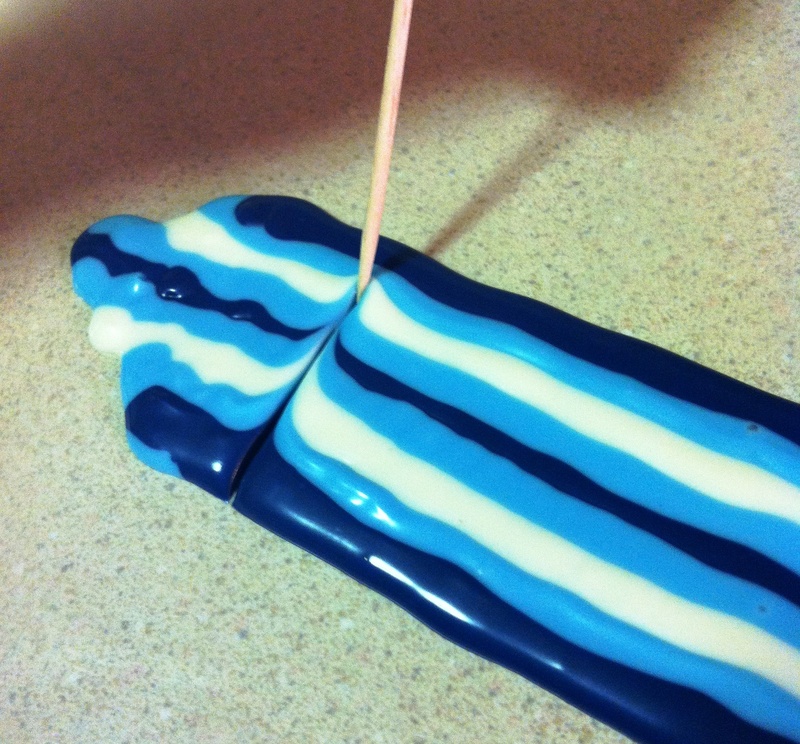 If there are still gaps in the chocolate from where the toothpick went through, give the wax paper a little shimmy (as described in the 3rd pic), and it should settle down into one flat piece of chocolate. Put your piece in the refrigerator for just a few minutes to set-up. 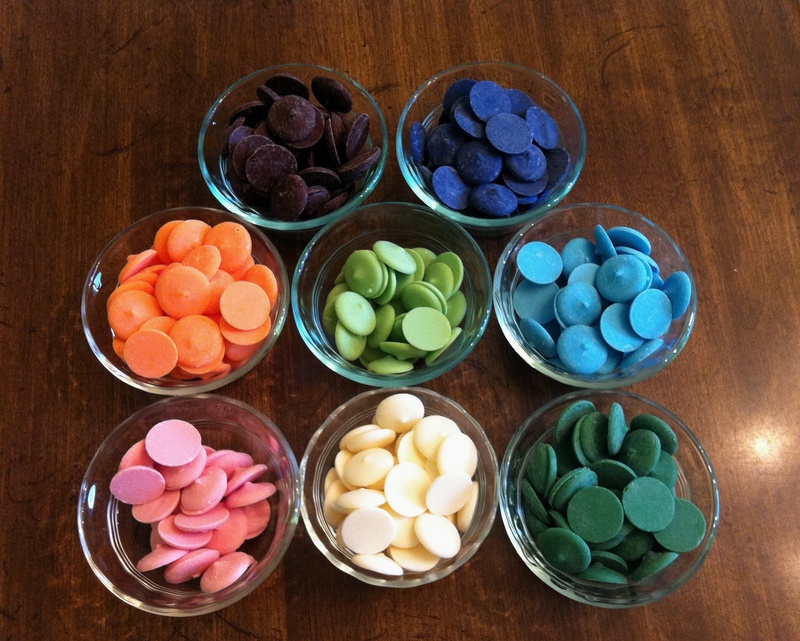 Using a circle cookie cutter, cut out a chocolate coin. Note: the thicker and the colder the chocolate is, the harder it is to punch out, and the more susceptible it is to breaking/splitting. Ta da! How cool, right? 🙂 I was so excited how it turned out, even better than I had it pictured in my mind (don’t you love that!). 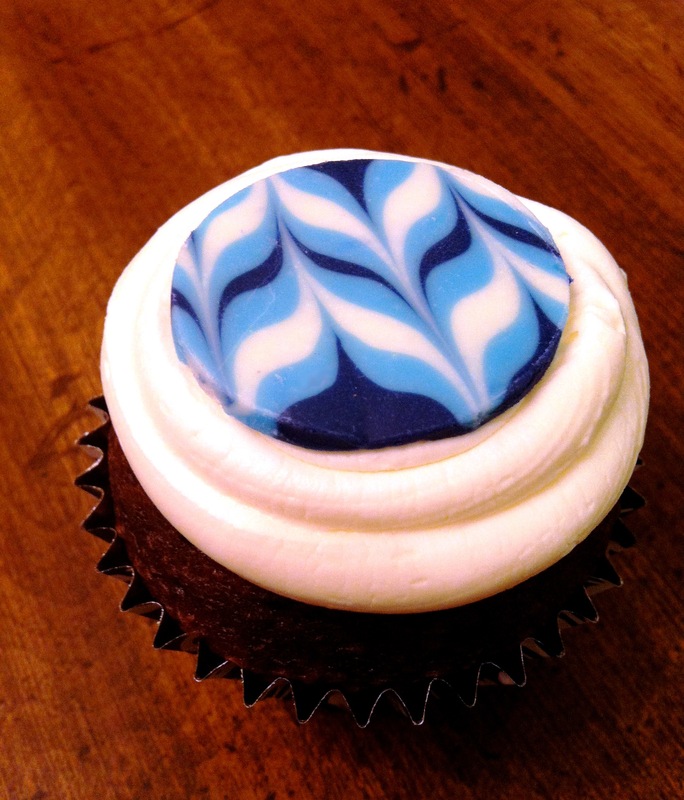 Pop it on a cupcake with piped frosting, and it looks like you bought it at an upscale cupcake store. Now if you want to get fancy, pipe some words in cursive on waxed paper, making sure all of the letters are connecting. After it hardens, gently peel it off of the paper … so elegant! 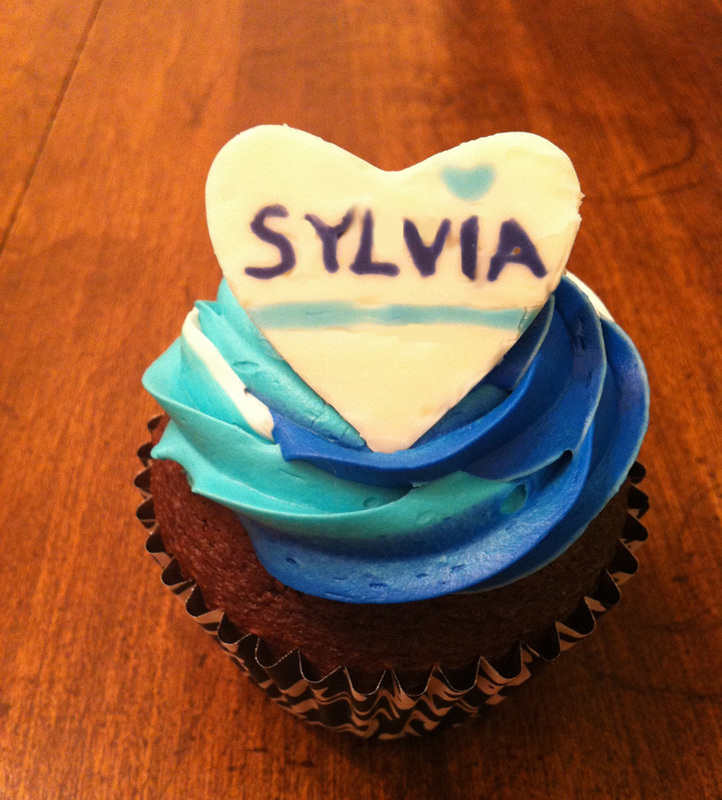 I was having so much fun with the blue theme, I decided to make some ombre frosting as well. This looks tricky, but really, it’s so easy. For multi-colored swirl frosting, you just need to put different color frosting into one large piping bag, and it comes out all pretty. 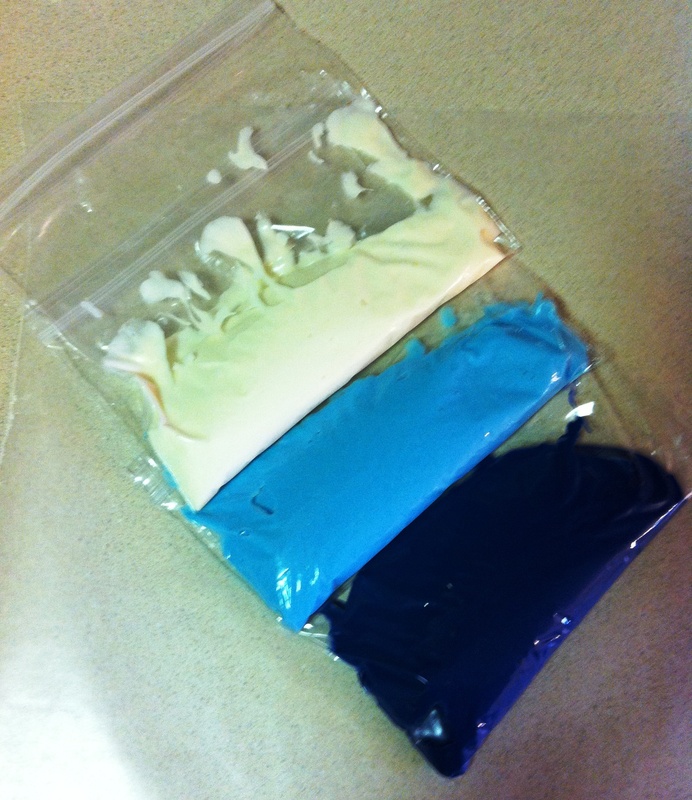 But, this can get kind of messy, trying to get spatulas of different colored frosting in and out of the bag. 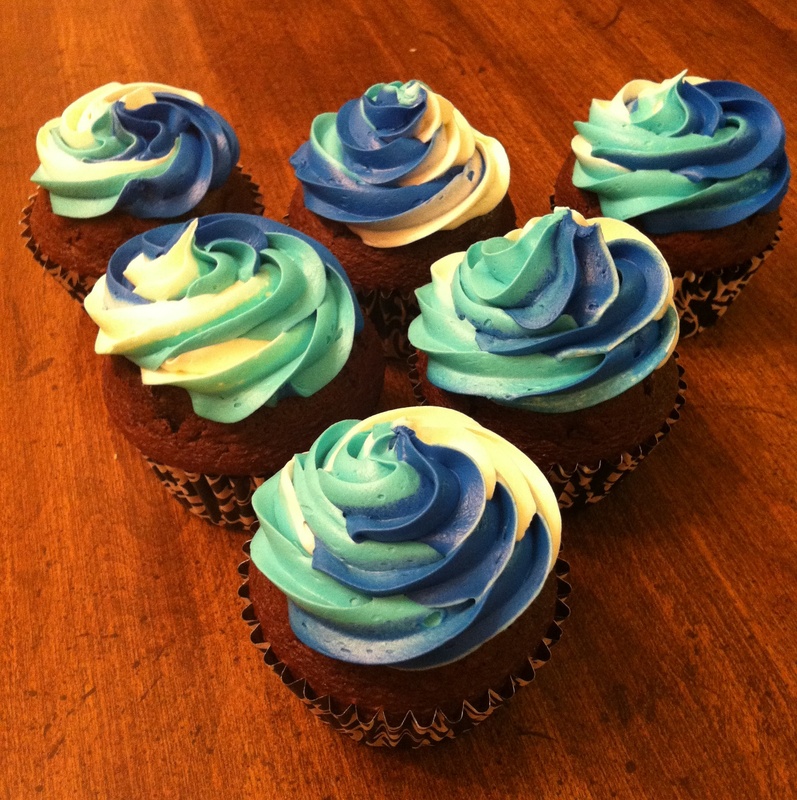 Luckily, I picked up this tip from Good Life Eats, and its been a much neater process – – place your different colored frosting into individual piping bags, then put those into one larger piping bag. I used a star tip, so the peaks would accentuate the color transitions. I love how each one comes out a little different! And because I was having such a good time & I had some leftover chocolate, I made some personalized toppers for my dear friend’s kiddos, whom I’m visiting later today. These are a little trickier (I using a toothpick to write her name backwards on the waxed paper), but its such a cute effect. I hope you enjoyed my little cupcake project 🙂 Have a great weekend! * Just a quick note about the pics in this post… some aren’t as focused as I’d like, but I forgot my camera in my office, so these are all from my iPhone. Great post! I am going to have to try all these ideas!!!!!!!!!!! What a fabulous idea! 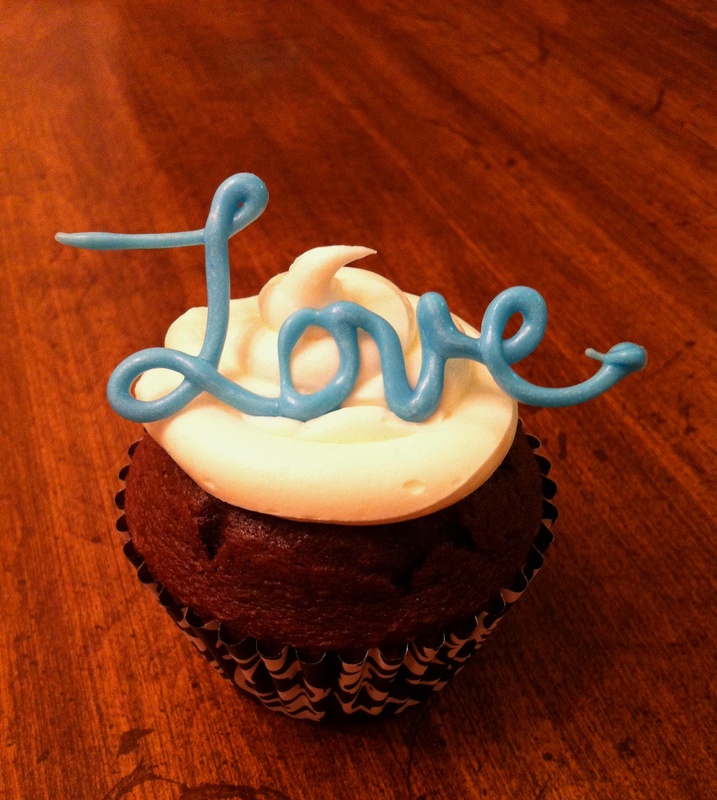 I love the multicoloured buttons and the ‘love’ word on the cupcake! I’m trying them all today………thanks for the tip! Love them! Awesome; thank you so much for the tutorial!! Who do you order your melts from? These are amazing! I am pinning this right now! I’ve never used colored melts before though I’ve seen them in stores. Now I’m going to have to buy some and give this a try! Thank you for a fantastic idea! Just a thought — I’ve done similar, but when cutting I dip a metal cutter into very hot water, dry it off and then use it to cut the pattern. 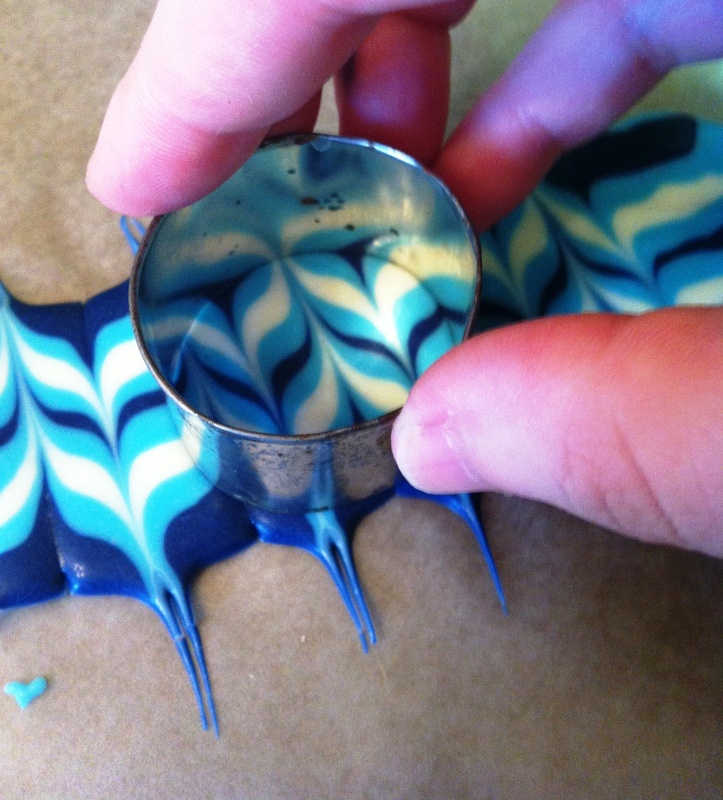 Go slowly and the cutter “melts” through, eliminating breakage.